As the pace of innovation continues to accelerate, staying ahead of this wave is something that both challenges and inspires us as software consultants. After a great week with the SpinDance Engineering team in Las Vegas for AWS re:Invent 2018, we’ve come back inspired and excited to share our experience and what we learned about the new tools and technologies with our co-workers and customers. Staying up to date with all of the AWS offerings can feel like a full-time job, and attending re:Invent is a great opportunity to learn in abundance from other engineers and AWS partners. It’s also a great opportunity to talk with and sit down with the engineers that help build some of these amazing tools. Below are some of the trending topics and themes we brought back. With announcements like IoT Events, IoT SiteWise, IoT Things Graph, IoT Device Tester, ML inference at the edge with Greengrass, the exploding curve of new technologies continues to drive forward for IoT. • IoT Events supports the creation of virtual state machines to allow the detection and handling of telemetry events across any number of devices. • IoT SiteWise supports the collection and organization of site-wide device data. This service was born out of many common problems in the industrial and manufacturing space and is another example of AWS packaging up a solution to a difficult problem observed in real-world applications…. Implicit in O’Reilly’s argument is the need for new ways of interfacing with these device networks to unlock their potential: What we need are user experiences that go beyond the level of a single device. This multi-device experience design is called interusability, and it is central to building successful IoT products. The term “interusability” was coined in 2005 by Charles Denis and Laurent Karsenty. They argued that conventional UX design was ill-equipped to handle multi-device interfaces. The discussion continued in 2010 when a group of researchers published a practical framework for interusability. In 2015, O’Reilly Media launched Designing Connected Products, which we at SpinDance consider the current definitive work on the subject. The Amazon Echo is a breakthrough product. It is the first consumer product with a voice-centric interaction model, and it has really caught on. 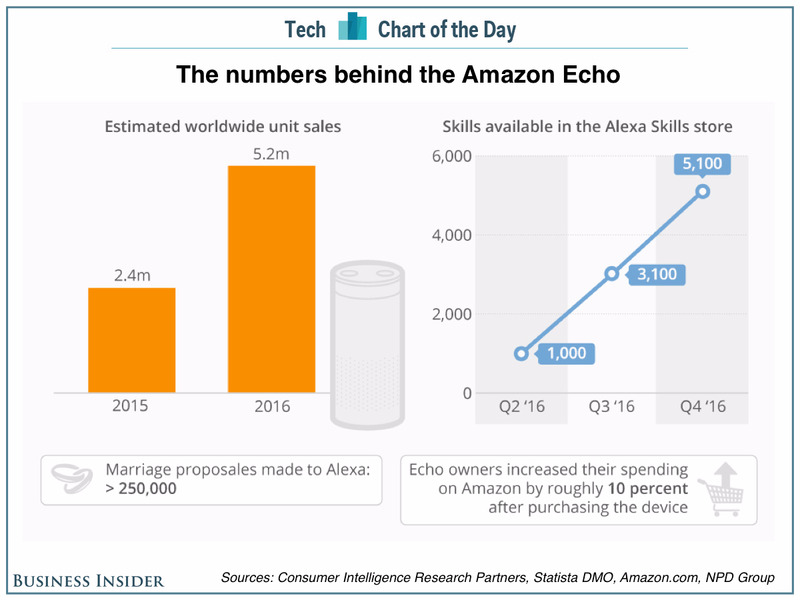 The number of skills (think apps… more on this below) available in the Alexa Skills store has increased 5X between Q2 and Q4 of 2016, and Amazon Echo sales have more than doubled between 2015 and 2016, from 2.4 million to 5.2 million. SpinDance recently created an Alexa skill that enables consumers to control Whirlpool and Jenn-Air home appliances with their voices. Along the way we discovered a better way to design skills, resulting in less code and increased flexibility. Read on to learn how you can follow suit. Alexa Skills are still relatively new, so before we explain the improved design methodology, here’s some background information on Amazon Alxa skills, and the traditional way of designing them. It might help to think of Alexa skills as mobile apps. Just like mobile apps add features to mobile phones, Alexa skills add features to Alexa-powered devices, like the Echo, Echo Dot, or even a Kindle tablet. The Consumer Electronics Show just wrapped up, and, as usual, there is a massive amount of IoT news to sift through. There were thousands of products announced, and miles of press coverage to read. We’ve been closely watching CES back at SpinDance HQ, and in the next couple of weeks, we’ll be sharing our thoughts on the winners and losers, and what CES says about where IoT is heading. But today, we wanted to focus on one of our favorite clients, Whirlpool, and highlight some of the announcements they made last week. We’ve been working hard to support their IoT initiatives, and we wanted to discuss some of the technology behind the announcements. Amazon’s voice assistant Alexa was huge presence at CES this year, and Whirlpool announced they are integrating 20 appliances with the service in 2017. It is a well-architected system: Amazon does the heavy lifting of voice UI and provides a clean API to developers. We’ll be blogging about Alexa later this month, and our approach to integrating major appliances, IoT platforms and voice services. We’ve been testing this in house for a while, and we think consumers are going to love it. An all-in-one washer/dryer combo? Sign us up! Beyond the obvious labor saving benefits, this appliance includes integration with Amazon’s Dash Replenishment service….